It’s been a few months after arriving in Okinawa, Japan, and we are finally settled. With time already passing by, I knew I wanted to start traveling sooner than later. I got the weekends that Ryan was off work with extended holidays and set out to plan some weekend trips. 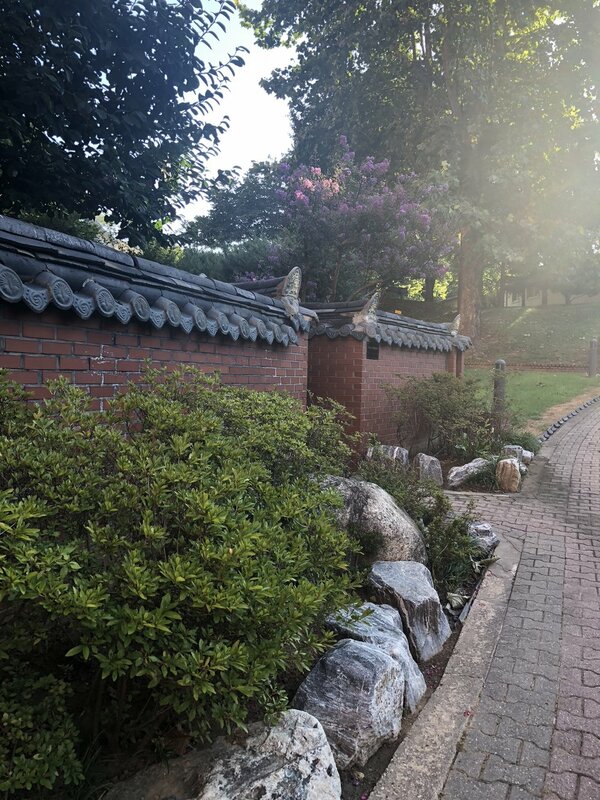 This trip to Seoul, South Korea was during August, and it was definitely still summer in South Korea and still very hot. So, it is a good idea to always have some water handy so you don’t overheat. One of the best things about being in Okinawa, Japan, is that you are in the middle of a lot of Asian Pacific countries. There are many areas within a 3 hour flight of Okinawa, Japan. So I started planning these shorter trips first. This past winter South Korea hosted the 2018 Winter Olympics. Many friends have also recommended this country and also a lot of people in travel groups on Facebook. I started with plane tickets first. We booked through Peach airlines directly. It’s a direct flight of an hour and a half and we could only pack carry on suitcases, which for a weekend is definitely feasible, about $130 roundtrip per person. So this is where we ran into a little problem on our trips. At first at the Naha airport we went to the International terminal first. But thankfully, and quickly, we found out that for Peach airlines we had to take a shuttle to an outlying facility instead. We made the shuttle and started to check into our flight. As we went through security and then immigration we were stopped again since Ryan’s leave orders didn’t include my name. After thinking we would miss our flight we tried showing Ryan’s military orders that included my name and we were able to pass! Whew! That was making me nervous. Then it was on to hotels. 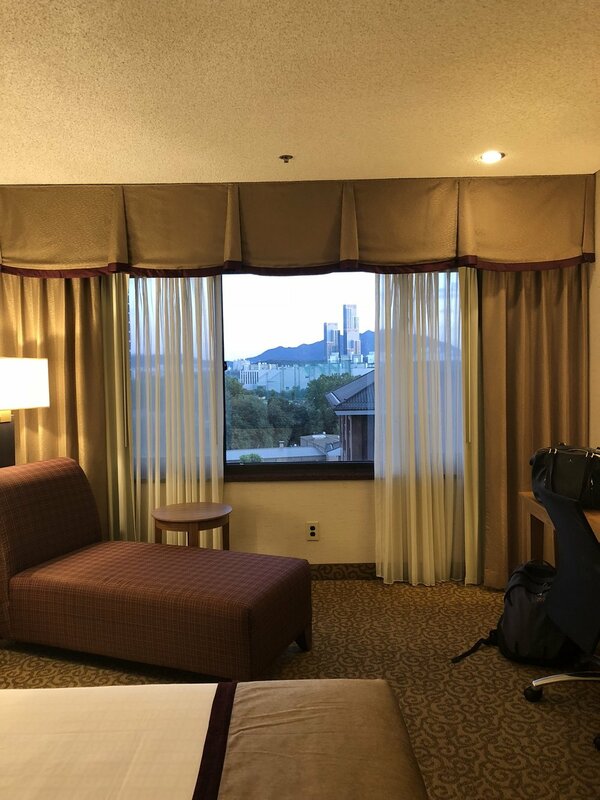 As a military family we have access to a few resorts around the world and one of them is the Dragon Hill Lodge on base in Seoul, South Korea. Again, it came recommended by many friends and we also heard that they may be shutting down in the near future so I knew I wanted to stay here before that happened. I actually lucked out big time on this expense. Because during August they were running a 30% off special and included breakfast if 3 days or more were booked! This brought our total down to $70 a night at this hotel! And it’s super fancy with many stores and gift shops inside and lots of restaurants as well. They even provided free transport to and from the airport which saved us $60 each way if we had chosen to take a taxi instead. On Saturday I was able to book the Full Day Essential Tour by Traesco through Tripadvisor. I highly recommend this tour! 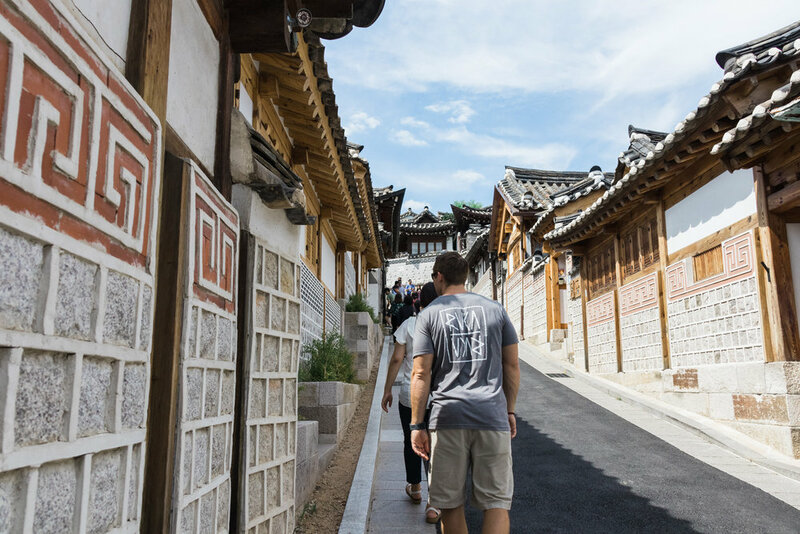 It was a full day of awesome stops and you learned so much about South Korean history. And the best part was that we were picked up at our hotel in a spacious, air conditioned van, and dropped off at every stop. Definitely a must when it was so hot in August. Jogye Temple is a Korean Buddhist temple in the heart of Seoul, South Korea, and surrounded by city life and skyscrapers. It was founded in 1395 as Gakhwangsa Templeand survived through the Japanese colonial invasion when they tried to suppress Korean Buddhism. As we came to learn throughout the day, Koreans love color and so this temple was surrounded by color through lanterns and the painting on the temple itself. There was also a lily maze out front that was a very pretty entrance to the temple grounds! The lily flowers were as big as my hand and going through the maze was a lot of fun. This was the royal palace of the Joseon dynasty and a great place to visit! 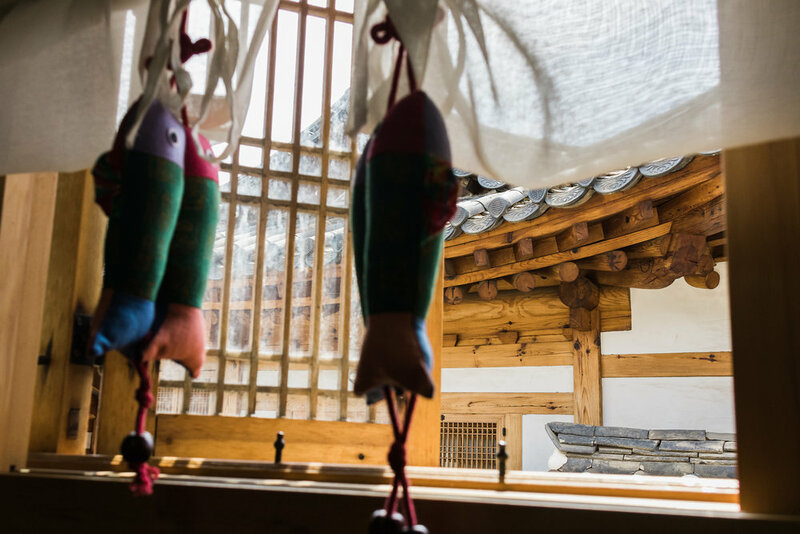 The palace was originally built in 1395 and served as the royal house and also the government of the Joseon dynasty. During the Imjin war (1592-1598) it was burned down. In 1867, it started being rebuild but then during the Japanese invasion it was sadly torn down again. Since 1990, efforts have begun again to rebuild it. 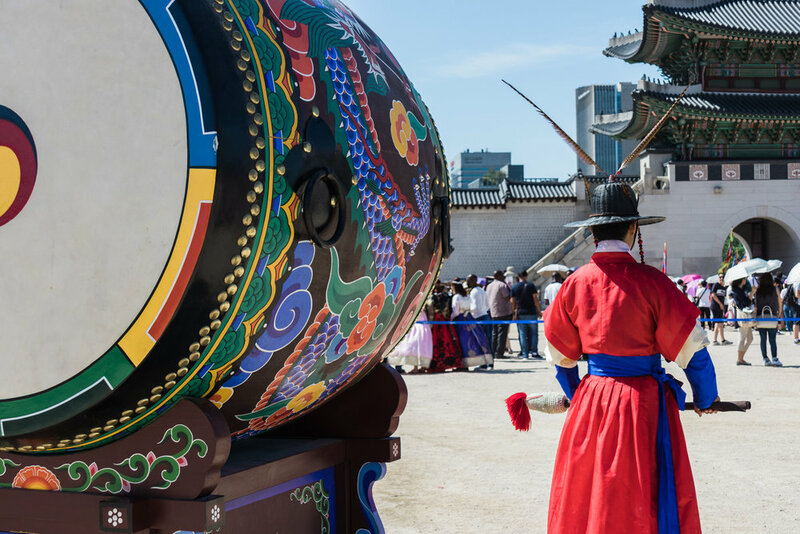 We were there at the changing of the guard’s ceremony and learned how Koreans used the nature around them to protect their palace. The mountains directly behind the palace act as a natural defense and was also the Emperor’s hunting grounds. This is a huge palace and you could have easily spent a few hours exploring but it was off to our next stop after an hour. So this was a very cool shopping district with trees lining the sidewalk and providing some much needed shade from the summer sun. The stores here are full of cool trinkets and there are lots of cute cafes that smell so good from the street. At the end of the street there was even a street musician playing such beautiful soothing music. We enjoyed it with some coffee and pastries. 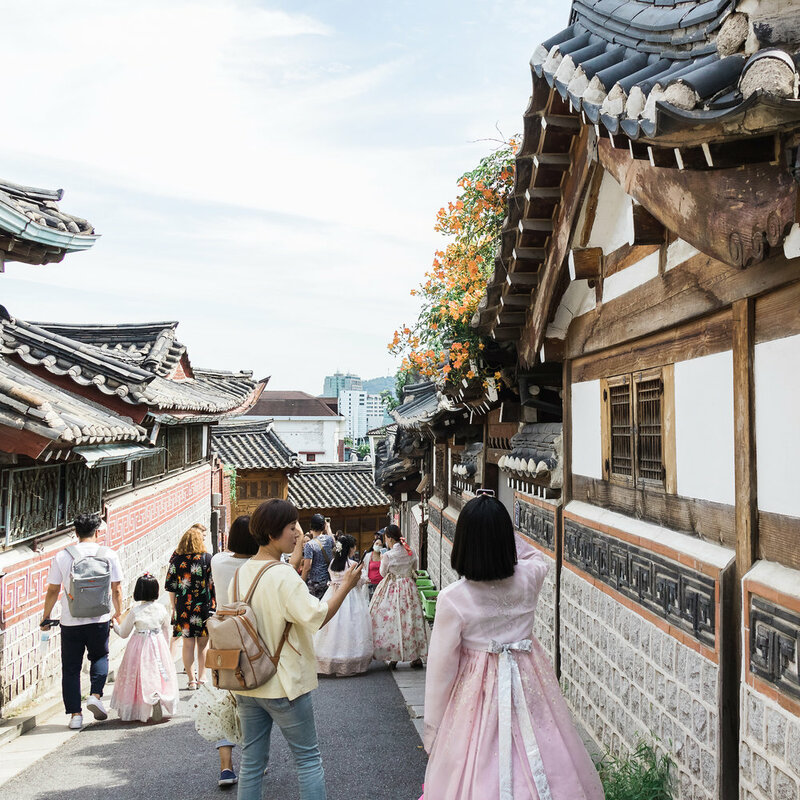 Also along this street there are many hanbok stores that allow you to dress up in traditional Korean clothing and take pictures! I did not tell Ryan about this part but it was so funny watching each other being dressed in Korean clothing! I never shared these pictures on Facebook so here you go! Haha! So this was probably my favorite stop on the tour. 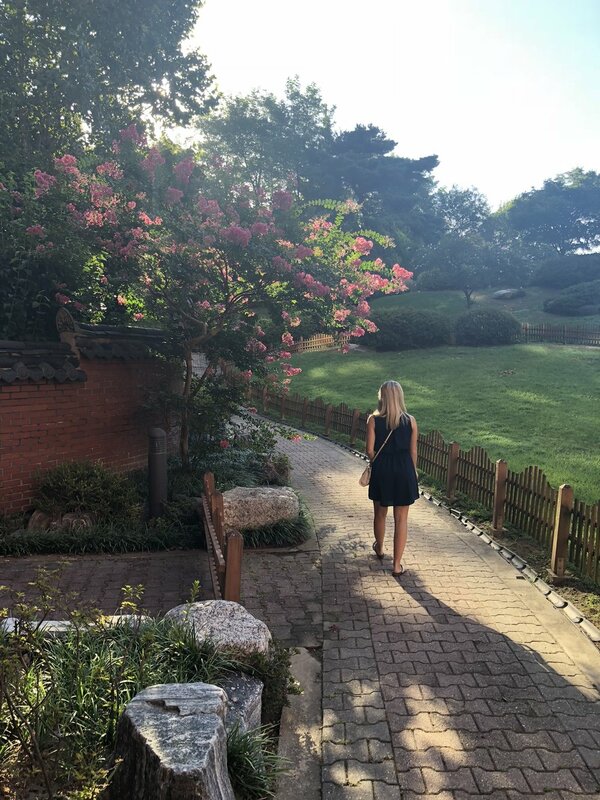 I love old architecture and this well preserved traditional Korean village was so special to see! You really felt like you were living in a different time. We definitely plan on coming back during winter to see this village covered in snow! 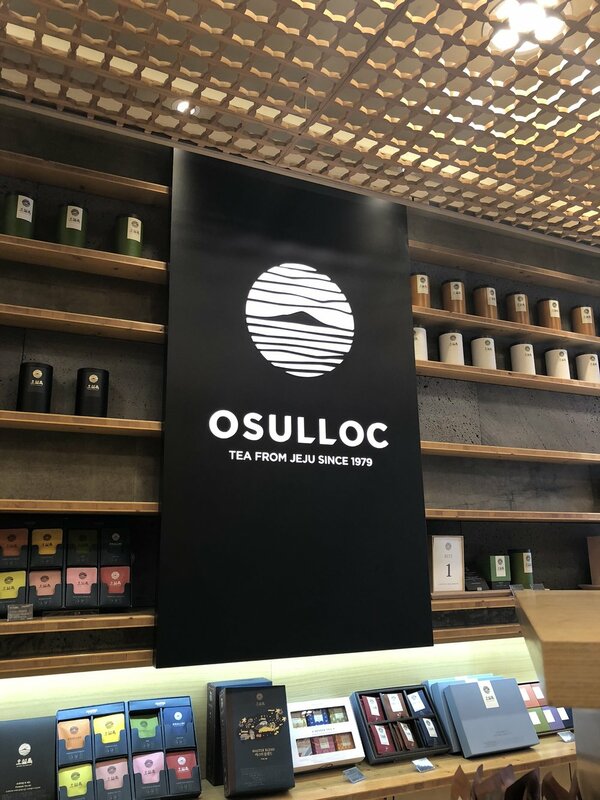 This is a must on your trip to Seoul. 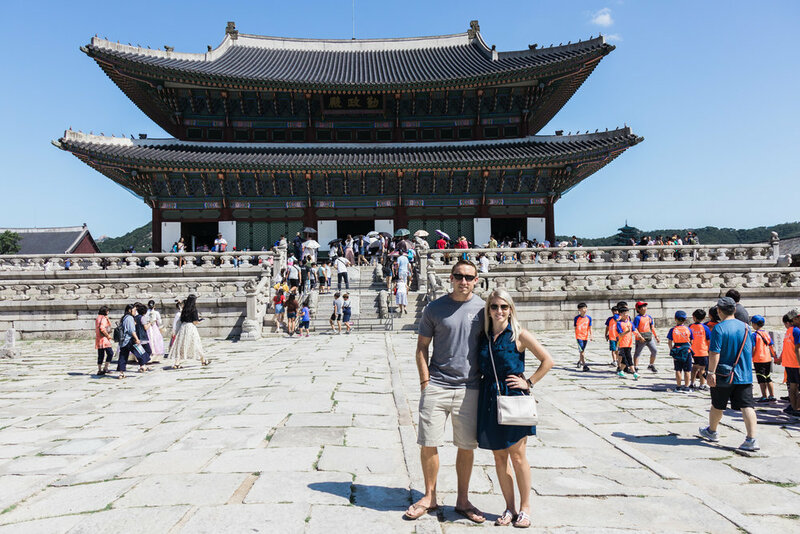 Normally for this tour you would walk around in the traditional Korean clothing but it was way too hot for that so we changed back into our normal clothes. One of the last stops was Mt. Bugak where you could see the city views of Seoul. Besides that there’s not too much to do at this stop. It is a great place to also see the mountains that divide North and South Korea. And we were told there are some very old monasteries up on those mountains along with some great hiking trails. Definitely something we will check into next time. And if you’re a photographer I’d recommend coming back at sunset and catching the sunset over the city and staying for some night time shots. This is the well known shopping district of Seoul, South Korea and it was really fun to do. This is the best place to find South Korean cosmetics and where I found my favorite face mask that I still use! It was also our last stop on our tour. So much ground covered in one day.